Artist's Comments: I had so much fun painting “Beach House Twilight” that I wanted to paint the same subject during the day to experience how color variations occur between night and day. The ponds reflected the sky and took on its color. The ocean was an intense blue. Beach umbrellas were open and ready to protect guests from the warm sunshine. 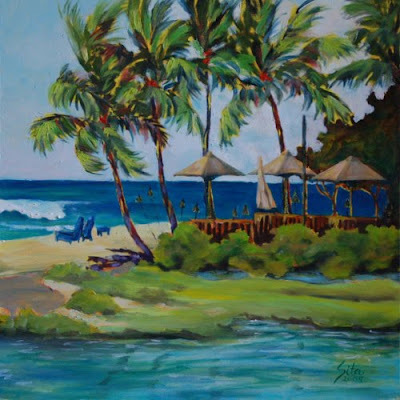 This painting reminds me of relaxing at the Beach House, enjoying a little lunch and perhaps a Hualalai lemonade while gazing at the sea and visiting humpback whales. Life can't get much better than this!